JOSEF is a Jewish boy living in 1930s Nazi Germany. With the threat of concentration camps looming, he and his family board a ship bound for the other side of the world . . . 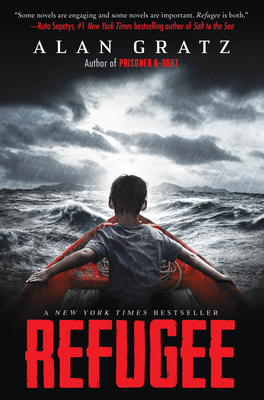 This action-packed novel tackles topics both timely and timeless: courage, survival, and the quest for home. Alan Gratz is the New York Times bestselling author of several books for young readers, including Grenade; Refugee; Projekt 1065, a Kirkus Reviews Best Book of 2016; Prisoner B-3087, a Junior Library Guild selection that was named to YALSA's 2014 Best Fiction for Young Adults list; and Code of Honor, a YALSA 2016 Quick Pick. Alan lives in North Carolina with his wife and daughter. Look for him online at alangratz.com. * "Gratz accomplishes a feat that is nothing short of brilliant, offering a skillfully wrought narrative laced with global and intergenerational reverberations that signal hope for the future. . . . Poignant, respectful, and historically accurate while pulsating with emotional turmoil, adventure, and suspense."